One of the best things about starting this estate planning practice with my wife Caroline in Miami is that we decided to have our staff meetings at the beach before going into the office. It takes away much of the stress. This morning, as we were talking about my endless list of things we need to do, Caroline said something that just hit me in the gut: “Sometimes we disguise our fear as overwhelm and indecision. As we act, the fear goes away. We can just start where we are and adjust as we go.” Ouch! 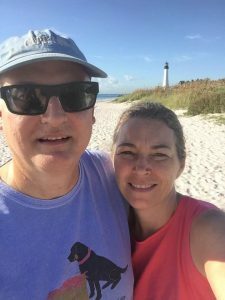 She reminded me of our own journey with estate planning: when our first daughter was born, we wanted to put a plan together, but then we moved down to North Carolina. We had our son a year later, and put in a barebones plan and got some insurance. We didn’t change anything when our third child was born because things were in flux; I started law school and who knew where we would be after that? Then when my brother’s wife died and we needed new guardians for our kids, we said we would change after we moved to D.C. But there was always something in the future that we were waiting for. Something that would be settled. Our lives are still not “settled.” Life happens. Kids go to college, other cherished family members pass away. My mother and my brother both passed away fairly recently without any estate plan whatsoever, even though both knew that they had fatal diseases. My brother’s passing is why we are here in Miami and why I changed my practice to estate planning. My brother tried to scramble to put a plan in place before he died way too soon. He was always going to create a plan when he knew what was going to happen. What we were waiting for was the fear to leave. Now I know that the best plan is the one you have put in place. As we know more, we can always adjust later. Brilliant and helpful on so many levels!